The first things I collected were stuffed animals, but only two of them slept with me at night. Of all my friends and playmates, I dearly loved the little gray cat and floppy brown and tan spotted dog who slept under the covers and kept me from feeling lonely at bedtime. I’ve never lived anywhere very long without cats. I sleep with a little calico cat named Sally now. I collected small metal cars and loved to drive them around cities I made from colored blocks. When I was 17 years old I raced my mustang at Irwindale Raceway and won a few trophies. I collected 45 rpm records, songs I heard on the radio. I listened to them over and over again. Each week when I went to the music store for my trumpet lesson, I bought a new “single” to add to my collection. I pretended I was a disc jockey and would announce each record I played. One summer I won a contest on radio station KFWB by being the first caller. I talked to disc jockey Gary Owens and he sent me a Gary Owens coloring book and KFWB bumper sticker. When I was 42 years old and working as a reporter for a daily newspaper in Newport Beach, California, I did daily newscasts for a local FM radio station. Someone once told me they heard me in a supermarket where the station was playing. I collected coins and stamps, ordering them from catalogues and putting them into albums. I looked through everyone’s pennies, trying to find a 1909-S VDB, the rarest of Lincoln pennies. It never turned up. I learned that the reason certain coins and stamps were worth so much money was the same reason I’d never find them. I began investing seriously in my late 40s, having more luck in recognizing an undervalued stock than knowing when to sell it. I learned that for many investments, value and worth are temporary. As I grew up, my collections shifted from things to experiences. I collected friends, lovers and accomplishments. I collected books I’d read. I collected knowledge and learning. I collected songs and poems I wrote. I collected performances I played as a musician. I collected the talented musicians I played with. After I became a newspaper reporter, I collected my best published stories. I collected every famous and interesting person I met. I collected family photographs, all the way back to great grandparents, arranging them in albums. I collected my family, my parents and grandparents, the years of my marriage, the companionship of my sons. I'm waiting to collect a grandchild or two. I collect memories and as I grow old they reveal meanings to me I’d never fully understood. I collect the acts of kindness I’ve received and try to pass them on to others. I collect wisdom and continue to learn and relearn the lessons I’ve been taught from those still living and those who have passed on, their words still speaking to me. I collect knowledge of the joy and sadness in this world, the tragedies and victories of the spirit, the damnations and the revelations. Sometimes it’s all too much and so I pack some of my collections away in boxes and label them, knowing I can always go back and unpack, knowing I’ll never look inside some of these boxes again, knowing all things change and life should move forward, mindfully forward. 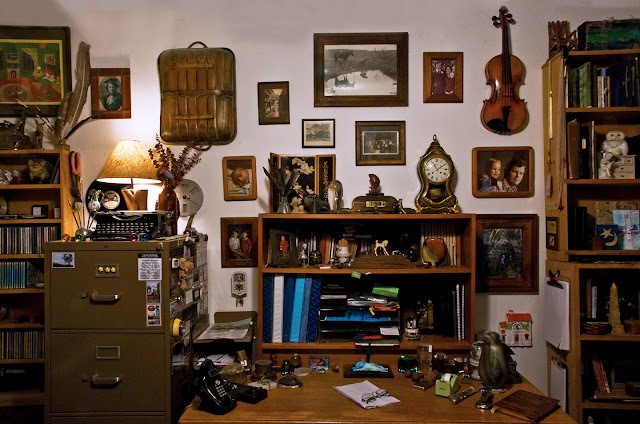 My house is full of things useful and decorous, impractical and silly, remnants of a long life. I look at these things and they remind me of who I have been, who I still am. I suppose I will never completely discard my past, as long as it has something to teach me. I suppose all that I’ve collected has been an attempt to preserve happiness, wisdom and love. Someday I will leave all these collections behind, passing these objects and their meanings on to others, but keeping the joy of having lived on this Earth in my eternal heart.